In the labyrinth of tunnels which make up The Vaults, one of London’s most exciting and versatile performance spaces, a new immersive music concert experience is hoping to enchant audiences old and new with a combination of gorgeous classical music, stunning set pieces, and entrancing performances, inspired by Disney’s 1940 classic Fantasia. In the foyer at the entrance to Sounds and Sorcery celebrating Disney’s Fantasia, audiences don a set of headphones playing binaural recordings, and roam freely through 5 dreamy rooms, inhabited by all manner of wonders. There’s an enchanted garden where flowers glow and a disembodied voice whispers in the air, a room where a destructive volcano pulses in the pitch darkness, and a couple of iconic characters from the original film also make appearances too. But Disney fans take heed; the famous mouse does not make an appearance. What’s immediately obvious is that Sounds and Sorcery would benefit from more structure. After queuing to be let into the attraction, audiences are met with several glowing clocks, which denote whether each room is ready to be entered or not. There’s a lot of milling about aimlessly, waiting for a room to be ready, and it does feel a little anticlimactic. 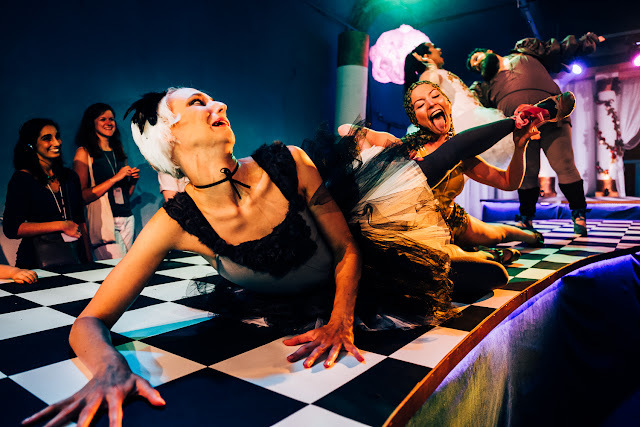 However, the bar is always open, and therefore the hilarious Dance of the Hours, which takes place in the bar area every few minutes, is the most easily accessible first stop. And one of the most enjoyable! The whimsical Dance of the Hours is an adorable segment which sees a parade of animals take to the stage to show off their dancing skills, there’s a clumsy knock kneed Ostrich, an attention seeking hippo, a noble elephant, and a fearsome crocodile. Miranda Menzies’s aerial silks display as the hissing croc is a particularly exhilarating moment, and when the animals take their bow and exit the audience is definitely left wanting more. At least there is a particularly inventive themed cocktail menu to peruse in the gaps between performances. The Sorcerer’s Apprentice is also great fun, combining the instantly recognisable symphonic poem with an engaging live action retelling of a cleaning spell gone awry and anthropomorphic brooms turning on each other, all set within a dank candlelit cavern. Without a doubt, it is the cast of fantastic live actors who bring Sounds and Sorcery to life, and both the Sorcerer’s Apprentice and Dance of the Hours are delightful. However, as a result, the rest of the exhibition, which seeks to engage audiences through solely the use of music and otherworldly visuals, falls slightly flat. 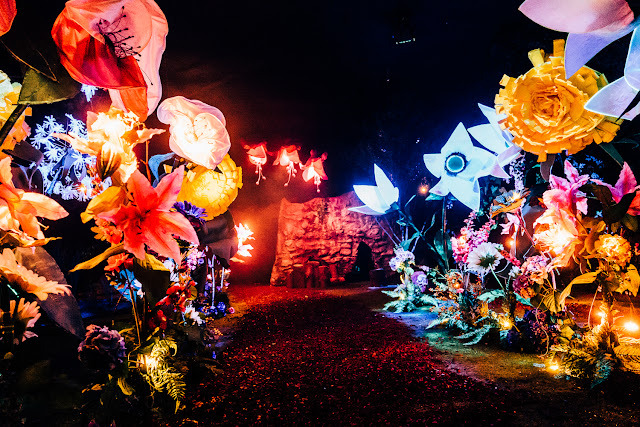 The psychedelic garden is mystical (and very instagrammable thanks to Kitty Callister’s ethereal designs), but even so there’s not much to engage audiences for more than a few minutes, despite the gorgeous tones of Tchaikovsky’s The Nutcracker Suite playing through their headphones. The same goes for the room containing an inhospitable volcanic world, which is underscored Stravinsky’s Rite of Spring. The world looks visually stunning, and sounds magnificent, but there’s not much to do other than stand and listen, and wade through a few foam blocks symbolising cooling magma, and so audiences quickly move on. Additionally, the venue does look and feel quite rickety in places, with crackling headsets, sheets blowing back to reveal backstage mechanisms, and at one point, a rather sad looking bubble machine foaming up a black curtain which was seemingly put in place to keep it hidden. While these issues are mostly seemingly minor, they do rather deteriorate the atmosphere of the experience, which should feel entrancing from start to finish to achieve the desired effect. 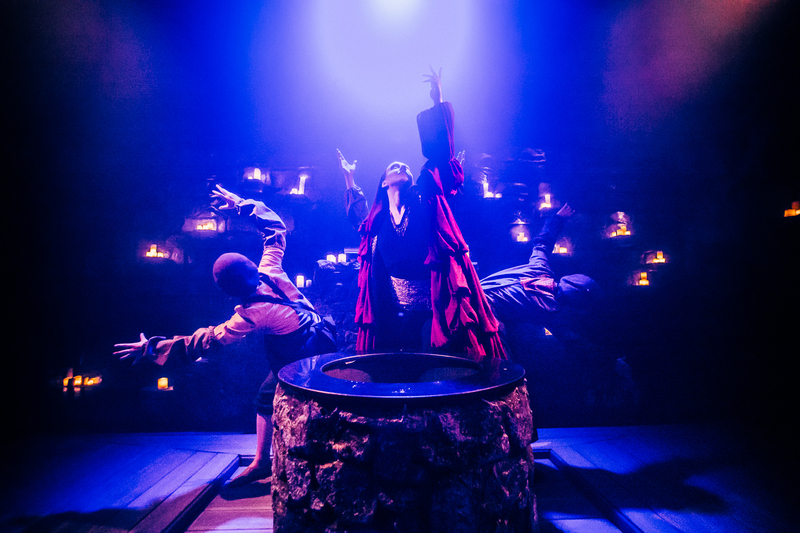 All in all Sounds and Sorcery is a production of two halves. Some magical high points combine music, production design and performance to great effect, and showcase the exquisite orchestral recordings of the Prague Philharmonic Orchestra. But the sparsely populated word which frays at the seams at times leaves the attraction feeling a bit underwhelming.